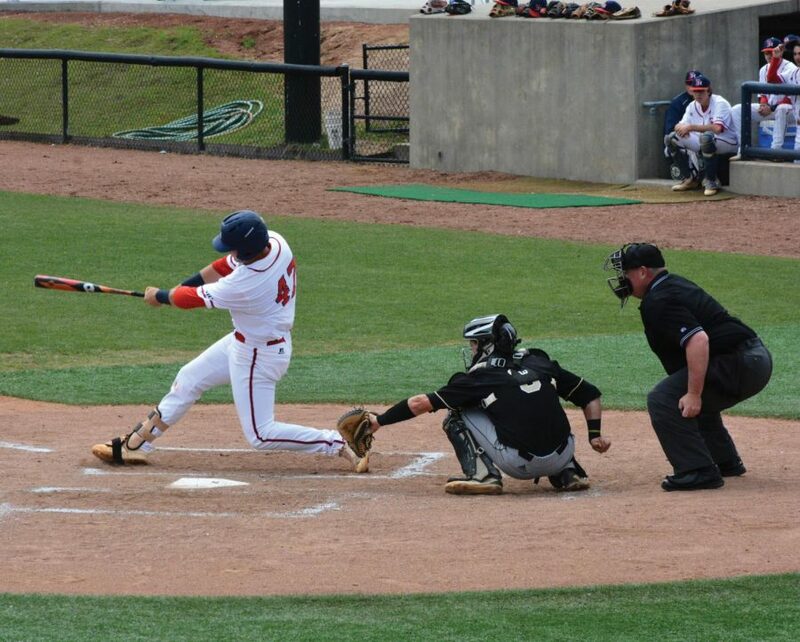 Trey Chapman, senior, scores a run against UNC Pembroke to help the Patriots win one game in Sunday’s double header. 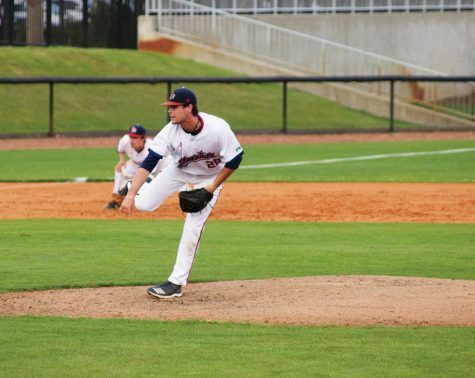 In a week of changing fortunes for Patriot baseball, an eighth inning flourish of eight runs would see them recover the lead to beat close in-conference rival UNC Pembroke 14-8 in Sunday’s first game at Sparrow Stadium. Christian Umphlett took the win, pitching two innings and only giving up one earned run. 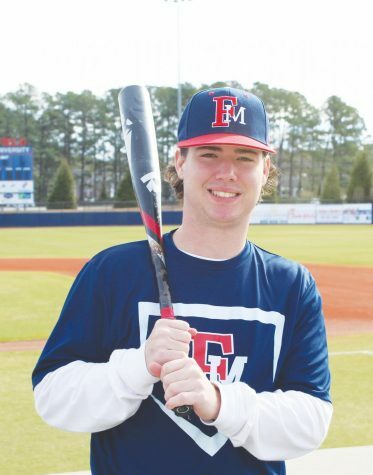 Patriot catcher William Robbins led the Patriots on the offensive going 3-5 with three runs. The UNC Pembroke Braves began the rescheduled opening game of Sunday’s doubleheader in a productive fashion, registering a quick-fire 6 runs in four innings to immediately put the pressure on the Patriots. It was not quite the same start for the Patriots who only managed 3 runs in the same opening four-inning stretch. The Patriots clawed back another run in the fifth to slightly narrow the Braves lead, but UNC Pembroke quickly restored the deficit. The Braves were consistent in their hitting, making it difficult for the Patriots pitching staff who saw four different pitchers enter the game. But despite the Braves holding the lead for seven-and-a-half innings of this second game in the series, it would be a blistering eighth inning offensive display that would carry the Patriots home. The Patriots found themselves one run behind as they entered the bottom of the eighth, but five hits would make a total of eight earned runs to take the score to 14-7 in the Patriots favor. The Braves battled hard throughout the game, but with just one inning remaining, there was not enough time to counteract the Patriot’s burst. 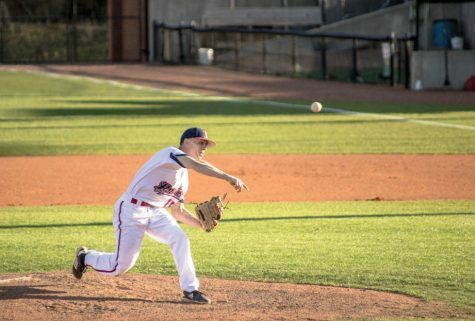 With only two series remaining in Peach Belt Conference play for the Patriots against second-place Columbus State and last place Georgia Southwestern, it is going to need to be nothing short of a perfect ending to the season to have a chance of snatching the last playoff berth. 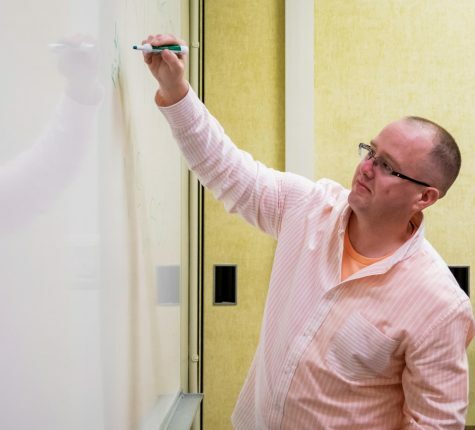 Sunday’s win could go a long way to not only helping the Patriots record, which currently sits at 14-24 overall and 6-17 in conference play, but also to boost the confidence of a team who needs to stick together as this season heads towards its climax. The Patriots will play Saturday, April 21 for a home weekend series against Georgia Southwestern.